West Palm Beach is an area known for its tourist friendly roads and open beaches, all welcoming to pedestrians that have come to enjoy the sunny days and wonderful nightlife that Florida has to offer. Joggers, walkers, skateboarders, bicyclists, even hoverboards are out daily taking in the sun and using the roads as they were intended. Sidewalks, crosswalks, avenues, boulevards, state roads and streets can all find themselves with pedestrians moving along them. Sharing the roads with normal car drivers should be a safe experience, if the driver is careful. The grim reality is that careful driving is not always the case. Sometime pedestrians can find themselves in accidents that they had no fault in causing. Trucks, cars, Uber, Lyft, motorcycle and scooters all have the possibility in causing the pedestrian irreparable damage and leaving them absolutely broken. 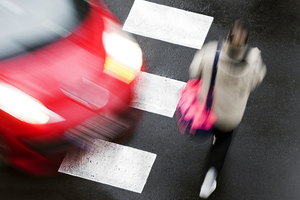 The Wolfson Law Firm has been fighting for the rights of pedestrians since 1963. Their personal injury and wrongful death attorneys have served the community of West Palm beach and beyond, and they’re more than willing to help you in your time of need. Give them a call at (855) 982-2067 so that you too can get the quality service of their lawyers, and so the burden of your injury does not seem so heavy with the right people helping you out. Florida Statutes provide protection for pedestrians. These laws must be followed for the safety of the pedestrian to be guaranteed. Drivers though also must be aware of the road, and those on it. Regardless of the protections that are given by the Florida Statutes motorists on the road should be aware of their surroundings. Although a pedestrian can find themselves in an area where the statute does not protect them, it is still the responsibility of the driver to be aware of the road. If you were a pedestrian that’s been struck by a car, truck, or motorcycle, then you are entitled to compensation. All information regarding your accident is important. Your location, the status and attentiveness of the driver, and what type of injury you received because of your accident are all important information that could change the out-come of your case. Here at the Wolfson Law Firm, we can take the time to help investigate your circumstances and evaluate the evidence to make sure that you’re able to make a recovery without the worry of a bad case. The Wolfson Law Firm has been helping personal injury clients and their families from wrongful death and personal injury cases since 1963. Jonah Wolfson, the managing attorney at the firm, is a bilingual personal injury and wrongful death attorney who is willing to speak to you regarding your claim. He and his legal team have decades of service and are waiting at the toll-free line of (855) 982-2067. They’re also available to meet either at their offices located in West Palm Beach, Miami, Fort Myers, Fort Lauderdale or wherever it is most convenient for you. Do not hesitate, give us a call and get the compensation that you deserve after your accident.